This week, we had an inspiring conversation with Emelie Gonzalez, the winner of the Art of Selling Competition, about how she discovered her passion for video production by participating in the competition. The Art of Selling Competition was about creating a sales pitch or commercial for a favorite product or service. 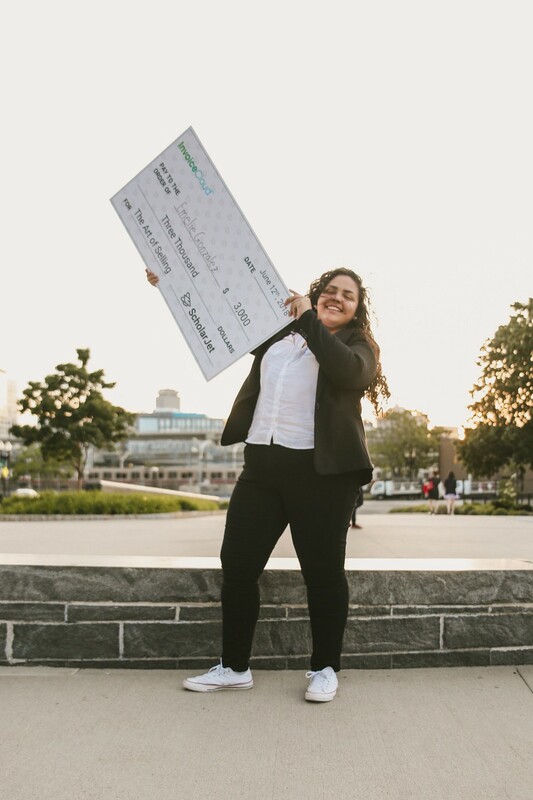 For Emelie’s $3,000 winning scholarship submission, she created a promotional video for East Boston waterfront restaurant, ReelHouse. The competition was created by Invoice Cloud, a SaaS company that provides trusted, secure, web-based e-payments and the highest adopting electronic bill presentment with payment (EBPP) solutions. Tuan: Thank you so much for doing this with us! What is your backstory? Emelie: My name is Emelie Gonzalez, and I am from Chelsea, MA. I will be going to Bunker Hill Community College this upcoming fall to study Communications andFilm Production. I want to be a director/producer in the future. Tuan: What feeling(s) did you have when you found out you were the winner of the Art of Selling Challenge? Emelie: I was ecstatic. As soon as I found out I told all of my friends and family, especially because now I won’t have to pay anything out of pocket for this first semester of college because of this scholarship. Tuan: What inspired you for your submission? Emelie: The scholarship asked to advertise one of your favorite places or products, so I thought to keep it local. I made a commercial for a restaurant that has lots of growth potential as well as really good food. Tuan: What do you think makes your submission stand out? Can you share what went through your mind as you worked on the submission? Emelie: I think my submission stands out because it was a real commercial that the restaurant actually wants to use, and I had a lot of fun making it. Tuan: What did you learn throughout the submission process — about yourself, your inspiration, the community or the industry? Emelie: The submission process validated that I love making and editing videos. Actually producing something, though, made me realize that this is what I want to do as a future career. Tuan: What did you learn about the company that created the scholarship and the meaning behind it? Emelie: I learned that Invoice Cloud is a company that allows people to pay bills online and that Boston actually uses their system, which is pretty cool. Tuan: Why do you think it is important to have alternative scholarships like action-based scholarships in your community? Emelie: Action-based scholarships are better than essay required scholarships, in my opinion, because they allow you to see the real potential a student has. Tuan: With your hard work, talents and skills how are you looking to create a better future? Emelie: I want to produce films that inform people of the problems in the world in a way that appeals to them. Different than documentaries, which sometimes fall on deaf ears (even though they shouldn’t), I want to produce real movies with real life problems and plots that appeal to a specific target audience. Tuan: What are two pieces of advice you have for future students who are looking to participate in an action-based scholarship? Emelie: First, be creative. Your submission should clearly put out your idea, and you should make something the judges won’t forget. Second, have fun! Don’t stress about it. Tuan: If you could have lunch with any person in this world, who would it be and why? Emelie: Steven Spielberg, who is an inspiration to me. He is my favorite director. To have lunch with him would mean the world. Tuan: Thank you so much for participating in our scholarship and congratulation once again! We feel fortunate that you are a part of our mission and a member of our growing community. CEO & Co-founder of ScholarJet. I talk about the future of education, diversity and inclusion, and entrepreneurship.